Summary : Wow! What else is there to say? This tea from the Dragonwater Tea Company (now out of business) perfectly combines chocolate and rum...and does it so well that you'll swear you are drinking a mixed drink...happily without the hangover effects! Review : I love mixed drinks...especially drinks that have rum or amaretto in them. Too bad I can't afford anything other than the 2 glasses of Gabbiano Chianti wine I drink a day. Then again, perhaps this is a good thing, otherwise I would end up spending my days in a alcohol supor...hungover by having too many rum and cokes or Amaretto and Seven's. Yet, I do miss a good mixed drink now and then. And so it happened that during my last order from the Dragonwater Tea Company (now out of business) I noticed a very appealing rooibos tea called Chocolate Rum. I could NOT resist ordering this tea and giving it a try...if as much for my curiosity as anything else. And who knows...perhaps this tea might solve my longing for a good mixed drink now and then. And have the happy benefit of leaving me hangover free, too! 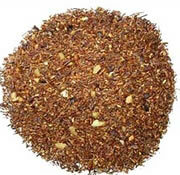 This roobios tea contains the following ingredients : Rooibos flavored with cocoa pieces, almond bits and chocolate-rum flavoring. The aroma of this tea said all...and said it in a very good way. Before opening the package the tea leaves came in, I was prepared for a cocoa aroma, or perhaps a rooibos aroma...both of which I enjoy. But alas! What I got was the aroma of rum! And a very strong aroma of rum too! I really couldn't believe my nose...a tea that really had a strong aroma of rum! Still, it is nice and all that the tea has a strong rum fragrance. But it is the taste that counts. So I brewed the tea for 8 minutes, inpatiently waiting for the tea leaves to do their thing. Well, it was worth the wait...and then some. This tea is just absolutely delightful...at least to me. Initially, at the very first sip, you'll get the standard rooibos tea flavor. But this only lasts a second or two. Because then, from out of nowhere, the cocoa and rum flavor hits...and hits hard! The cocal flavor is somewhat subdued...there is definitely stronger "chocolate teas" around than this one. But of course, I didn't care about that...I wanted the rum! And this tea did not disappoint in that department. Once the rum flavor of the tea kicks in after a few seconds, you will swear you are drinking a "hot mixed drink," the rum flavor is simply that good and powerful. And even better...the after-taste of this tea has a strong rum flavor too...and it lingers in your mouth seemingly forever. This tea also contains almond pieces. Well, I didn't taste the almond in this tea at all...but perhaps that is by design or something. In any event, if you are expecting a "almond tea" from this tea, you'll be disappointed. Overall, if you want a tea that tastes remarkably similar to rum, with a splash of chocolate thrown in for good measure, well...this tea from the Dragonwater Tea Company (now out of business) is for you! Recommendation : Absolutely. This tea is about as close to drinking a mixed drink that contains rum as you are likely to find. The rum flavor is strong, powerful and absolutely delightful. And it mixes perfectly with the more subdued chocolate flavor of the tea...forming a very unique and incredibly tasty tea. So if you are a closet boozer and are in dire need of a non-alcoholic drink...head on over to the Dragonwater Tea Company (now out of business) to pick some up...you won't regret it!